The Vivaldi antenna, sometimes referred to as or the Vivaldi notch antenna, and also known as the tapered slot antenna (TSA), is easy to fabricate on a circuit board, and can provide ultra-wide wide bandwidth. Peter Gibson invented the Vivaldi antenna in 1978, in the UK. 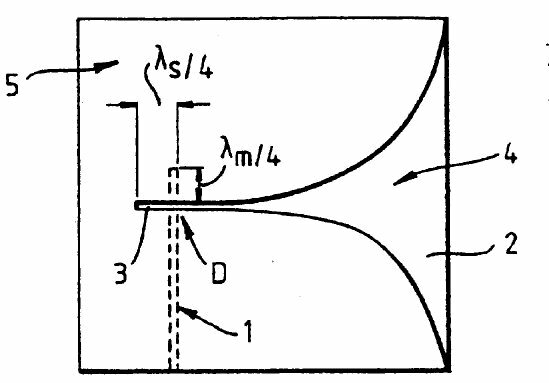 The Vivaldi antenna was first discussed in a 1979 IEEE European Microwave Conference paper by P. J. Gibson in a paper entitled The Vivaldi Aerial. In the abstract he describes it as "a new member of the class of aperiodic continuously scaled antenna structures, as such, it has theoretically unlimited instantaneous bandwidth." New for October 2013: we describe egg crate construction. New for March 2012: Peter Gibson now appears in our Microwave Hall of Fame! Gibson never said why he named his innovative antenna the "Vivaldi" aerial in the paper. If you ask an antenna engineer where the name came from, chances are he'll tell you Vivaldi was the inventor. Not so! The mystery of the Vivaldi antenna, solved? Antonio Vivaldi was a composer from the Baroque period. Why is his name associated with the tapered slot antenna? Now we know, thanks to Joerg. The answer can be found in ADVANCED RADIO ASTRONOMY ACROSS EUROPE, edited by Alastair G. Gunn, a Springer publication. According to an article on the PHAROS JRA focal plane array, it "received its name from a resemblance to the shape of a cello or violin, instruments used by Antonio Vivaldi, the designer's favourite composer". Read on, this published explanation may not be entirely correct. I knew Peter as I worked with him at Philips Research Laboratories UK from 1983 through to when he left in the late 1980s. After that I kept in contact with him through to his retirement and eventually his death. Peter was really into music, composing pieces, teaching piano in those days and was a church organist. He told me that he called the tapered slot antenna a "Vivaldi" as it looked like the cross-section of an early trumpet. Vivaldi had written a trumpet concerto, and it was the 300th anniversary of Vivaldi’s birth in 1678. Anyway, that was Peter's own explanation of why he gave the name. But the one you cite sounds good too. 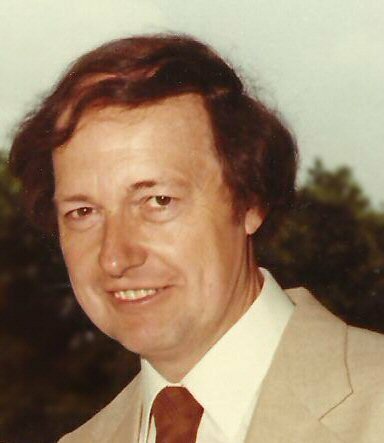 Thanks to Peter's wife Pat, and friend and co-worker Peter, we now have three images of Peter Gibson to share with the microwave world, and an interesting biographical sketch of him. The photo below is also from a celebration of Peter's 25 years with Philips, which took place in 1983. 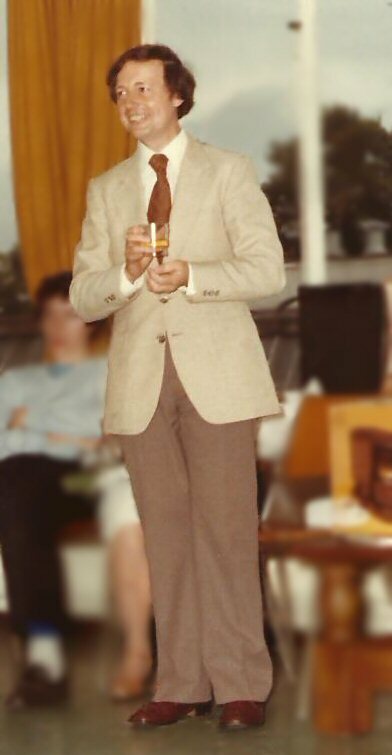 Just picture the bell-bottom pants slightly wider if you want to imagine what engineers wore in 1978 (the year the Vivaldi antenna was invented) when they were dressed up for such an affair. Peter Gibson was a chartered engineer, specialising in microwave devices and antennas, yet he never went to university. Born December 1934 in Gillingham Kent he attended Chatham Technical School at 11 and at age 16 he went to Chatham Dockyard to start a five year Apprenticeship in Electrical Engineering. 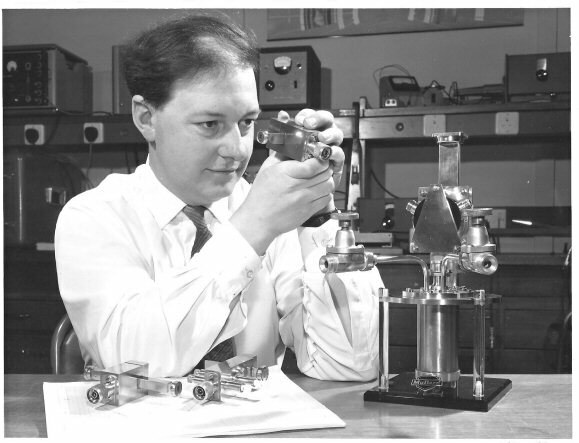 After his apprenticeship, aged 21, Peter joined Mullard Research Laboratories, Redhill. For the next five years he studied part-time at Croydon College for his ONC (Ordinary National Certificate) and HNC (Higher National Certificate). This enabled him to apply to become chartered with the IERE (Institution of Electronics and Radio Engineers – since merged with other institutions to become today's IET). Mullard Research Laboratories was built by and always owned by the Dutch electronics giant: Philips. Peter was to spend almost all of the rest of his career in Philips. For the first 30 years or so he remained at the Laboratories, which were renamed Philips Research Laboratories Redhill in 1977. Much of this time was spent working on microwave devices. (The first picture above shows Peter inspecting a microwave diode amplifier in the 1960s Click on it to see it at higher resolution). As part of this he started working on a variety of microwave antennas, which led to his invention of the Vivaldi antenna in ~1978. By the early 1980s Peter was spending all his time on microwave antennas, and published papers on microstrip arrays. He was awarded a fellowship of the IERE in the mid-1980s for his lifetime’s microwave work. In the late 1980s he transferred to the Philips factory nearby: MEL in Crawley (where he lived). MEL developed and manufactured medical equipment and military wireless and electronics. He joined a small group who developed and ran the antenna measurement and test facilities. Their main products were broadband microwave antennas for naval ships. These were used in the MEL detection systems that warned the ship of radars. Peter stayed at that site until his retirement. However the site did not remain part of Philips. When a few years later the cold war ended, the military products part of MEL was taken over first by Thorn EMI and then by Racal. Nowadays it is owned by Thales. 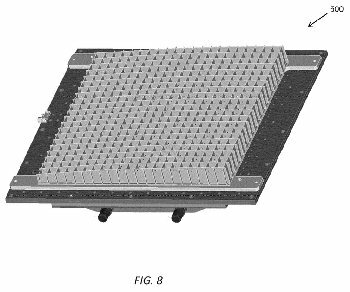 Below is an image of a Vivaldi antenna that we grabbed from U. S. patent 6,043,785, Broadband fixed-radius slot antenna arrangement invented by Ronald A. Marino. This figure was provided as "prior art", and provides a good picture of how the antenna works. A microstrip line (dotted) on the opposite site crosses a slot line. The microstrip line is terminated in an open circuit a quarterwave away, while the slot-line is terminated in a short circuit, one quarter-wave away. The effect of this interface is that the energy in the microstrip is fed to the slot line, and propagates to the right. The slot line gap opens up according to an equation which we will ignore for now. Often an antenna array must operate in two planes, in order to provide circular or switch polarization. The Vivaldi notch can be employed in an array by using "egg crate" construction, an example of microwave slang. The modern egg crate is usually molded plastic, so the young engineer might not know what we are talking about. 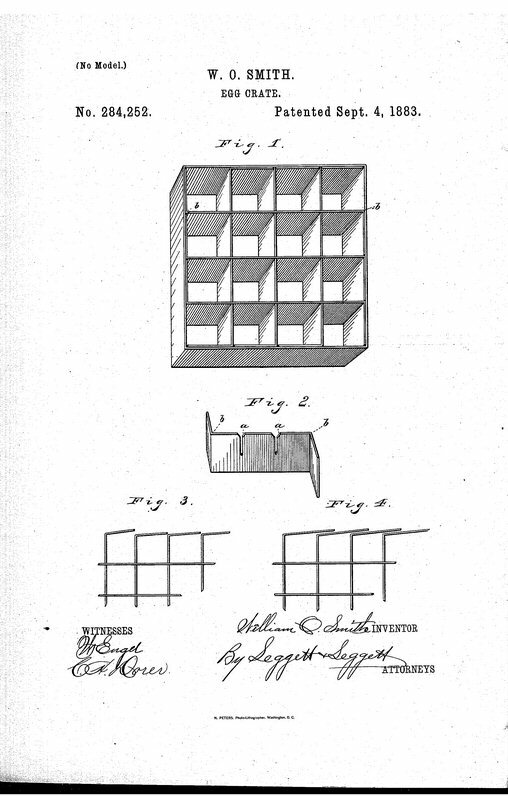 Below is an image from US patent 284,252 by William O. Smith, dating back in 1883. Here you can see how rows and columns of the crate fit together in interlocking slots to form compartments to hold individual eggs. This same concept can be applied to antenna construction. 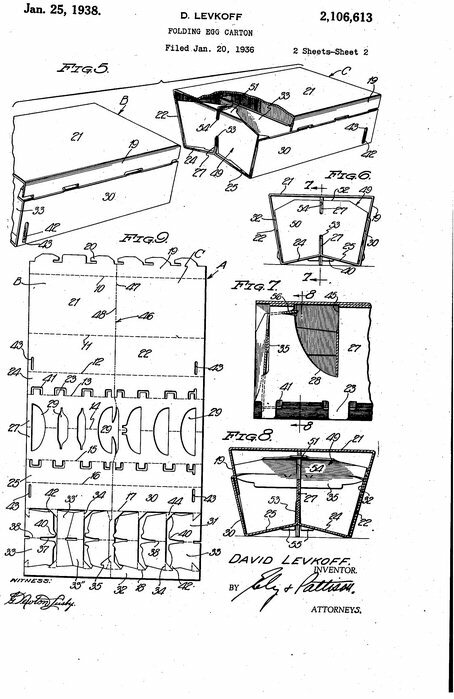 Below is an image from US patent 2,106,613, back in 1938, inventor David Levkoff, for a folded egg-carton. 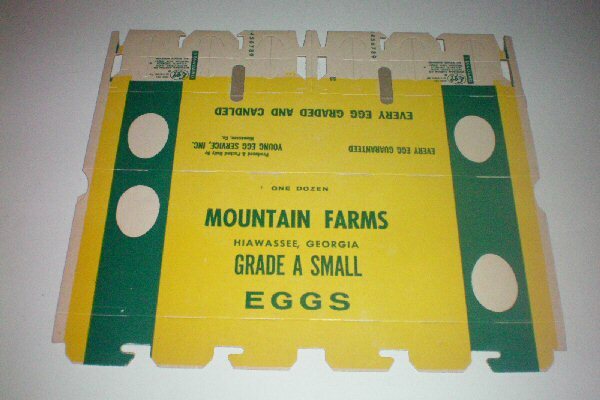 Unfolded egg cartons are offered on Ebay, for some pretty good money. Now let's talk about egg crate antennas that employ the Vivaldi notch element. The images below are from US patent application EP 2575210 A1 by Allen Wang et al of Raytheon Company. The intellectual property in this case has to do with making the egg crate planar on the bottom and conformal (to an aircraft) on the top. The image on the left is one of the many slats that are combined in the egg crate, if you look carefully you will see the slots in the bottom that accept similar slots in the tops of the orthogonal slats. On the right it has been assembled, if you look closely you will see the top surface is doubly curved. 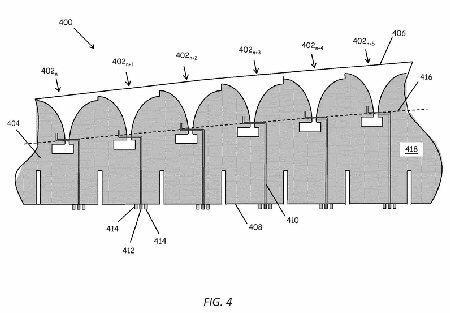 This antenna patent application states that the invention covers a range of 6.3 to 12 GHz. Note to legal team: describing the frequency of operation in a patent is probably unnecessary, and might be a limitation, but what do we know? What if someone uses this idea up at V-band? One consideration for egg crate construction is that all the ground planes have to be continuous. Often the grounds are bound together with a labor-intensive method of copper tape at all those corners, something an egg farmer never had to worry about.